a place for them to live and work. It is quite a testament to this tiny town that The Tate decided to locate its second gallery here. No other small town in the world can claim such an accolade! But The Tate is not the only great art gallery in St Ives - there are dozens of others worth visiting. Of all the jewels in Cornwall's crown - St Ives is the most dazzling. 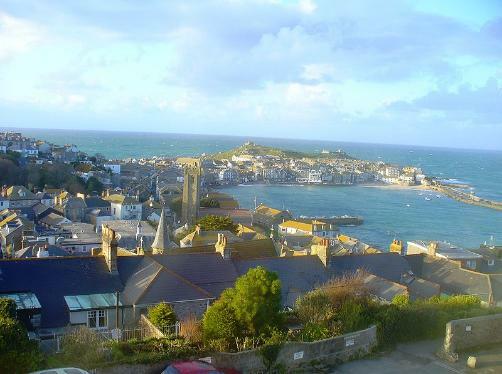 St Ives has the perfect setting, and St Ives is probably the most picturesque town in Cornwall. Local tip - visit St Ives out of season to enjoy the place at its best - with no crowds. This lovely town has been discovered and gets massively overcrowded in peak season. There are beaches here to suit absolutely everybody. Harbour beach is totally sheltered - and just about as safe for families as you will find anywhere. Porthmeor can get breezy - but when there is no wind it is a great sunbathing beach too. I can personally recommend The Porthminster Hotel - fabulous rooms in a stunning setting. And if I had to choose just one hotel in the St Ives area - it would be The Carbis Bay Hotel. On a smaller scale, The Garrack Hotel is truly wonderful. The Blue Hayes Hotel has exceptional suites at very good prices. And The Boskerris is absolute paradise for that romantic getaway! St Ives may not boast a big-name TV chef - but it does have some terrific restaurants. The Mermaid in the old fishing quarter is highly recommended. The Porthminster Cafe - right on the beach, has the perfect setting - and superb food! The Bean Inn at Carbis Bay is a wonderful vegetarian restaurant and a breath of fresh air! Hobblers House on the harbour front is the ultimate cosy seaside restaurant - I love it! "For my money the best place to eat is The Wave on St Andrews Street."